The game is a vertical scrolling shooter where the player controls a helicopter taking on hordes of enemies which include tanks, battleships, and artillery. It is interesting to note that, besides some airplanes taking off, there are no flying enemies in the entire game. The player's main weapon is an unlimited supply of missiles which travel a max distance of half the screen's height. The player also has two bombs which destroy all objects within a large circular radius. These bombs can be blown off by enemy bullets. The player is killed after only one hit, and is re-spawned to a point approximately one whole vertical screen-length later, thus progressing the player past the obstacle that had killed him, albeit at a high cost. The player is given three lives initially and bonus lives are awarded at 20000 points and every 80000 points thereafter. Flashing crosses scattered throughout each level award players power-ups depending on which color the cross is. A red cross will gives the player one side-firing mini-heli which shoots perpendicular to the player's helicopter. A white cross yields a forward firing mini-heli. It is possible to have a mix and match of side-helis, totaling no more than two. The green cross will award the player with an additional bomb, if the player currently has less than two. Grabbing power-ups when not necessary yields 5000 points. 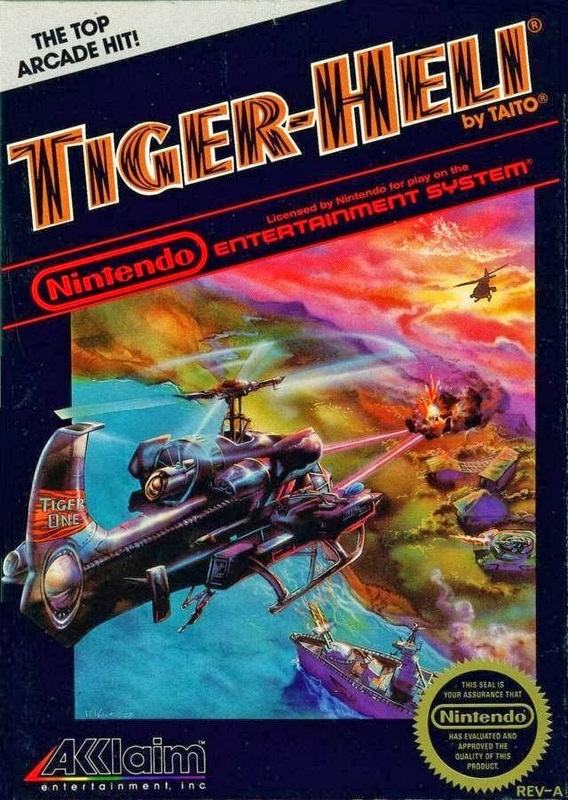 Tiger Heli was ported to the NES by Micronics and distributed by Acclaim in the United States and by Pony Inc. in Japan. Toaplan Shooting Battle 1 for the PlayStation (released by Banpresto) features an emulation of Tiger Heli. Tiger Heli had two sequels, Twin Cobra and Twin Cobra II, whose Japanese titles indicated that they were sequels of Tiger Heli. In addition, Tiger Heli (called Tiger in Japan) made an appearance in Let's! TV play classic series in Slap Fight Tiger as an alternative to the default aircraft Leopard.